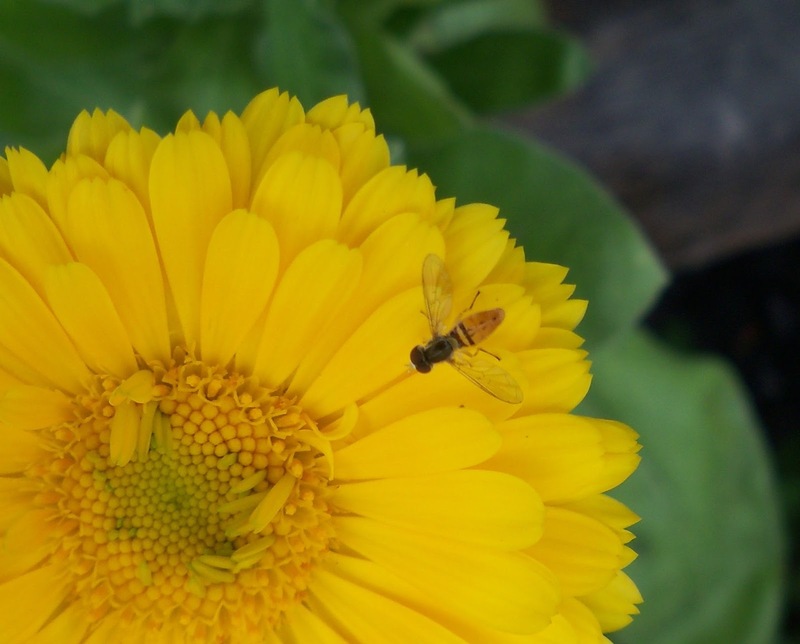 Whether you are a Beekeeper, a gardener, or just a happy observer of nature, you can promote a healthy environment for our happy pollinators and provide an area that is attractive to these special friends. Did you know that there are different kinds of pollinating bees? If you are not a beekeeper, you may not realize that there are pollinating bees that do not live in hives. We often speak of “busy” Honey Bees and Bumble Bees- but did you know that there are several other pollinator Bees? Solitary, non-swarming bees like the Red Mason bee, The Blue Orchard Bee, and the Bumble Bee live in holes in wood. The Red Mason bee can be seen in the garden from March to July and is responsible for pollinating top fruit and soft fruit. The Blue Orchard Bee is active from May to September and is an effective pollinator of summer flowers, herbs and vegetables. Both the Mason and the Orchard Bee are non-stinging and gentle. Bumble Bees pollinate shrubs, trees, garden flowers, and vegetables. You might also plan a dedicated “Bee Garden.” By planting all the Bee-attracting Herbs in one place you get to observe their behavior more closely. Look for a spot with some shade. Add a swing or bench so you can sit, read a book, and enjoy their behaviors and hard endeavors. Perennial Herbs such as Bee Balm, Catnip, Mint, Rosemary, Sage, Thyme and some Lavenders will be the “backbone” of your Bee Garden, while annuals like Borage, Chamomile, Cilantro, Fennel, Dill, and Parsley will add interest, too. Providing building supplies such as a heap of well-sifted soil, moistened with water nearby will keep your bees content. By growing large plots of nectar-rich herbs, Beekeepers can promote good health for the hives and improve the quality and quantity of their honey. Noted animal herbalist, Juliette de Bairacli-Levy felt that Bees are “instinctive and highly skilled herbalists.” Cultivars such as Clover, Alfalfa, Buckwheat, and Sweet Clover; and Wild Herbs such as Goldenrod and Aster, Chicory, and Kudzu are important sources of nectar. Frequently these are not abundant or are rendered poisonous to bees by herbicides and/or pesticide. ~Alfalfa is an excellent nectar-rich herb. Its honey is white to amber. 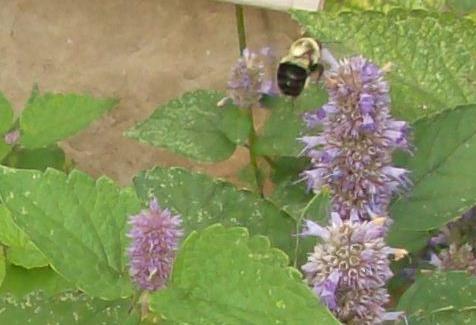 ~Anise-hyssop makes bees drunk with pleasure. They stumble over its perennial blooms all summer. ~Bergamot (Bee Balm) attracts with its red, pink, and purple “raggedy Anne” heads of color. 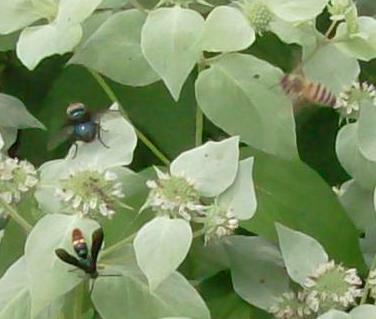 ~Buckwheat is another excellent nectar-rich herb which produces dark, thick, strong-flavored honey. Bees cannot get enough! 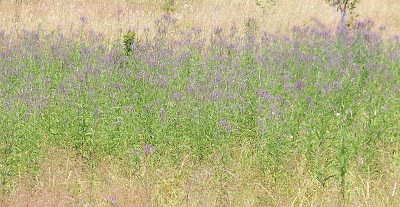 ~Catnip, rich in nectar, blooms well on wastelands, over a long period. ~Red Clover is another nectar-rich perennial herb which produces with to amber honey. ~Hyssop causes bees to happily stumble over it s blooms June to September. ~Joe-Pye Weed is a perennial nectar- producer in early autumn. Its tall pink blossoms produce strong-flavored light amber honey. ~Kudzu produces a lovely magenta colored honey with a fruity taste. ~Marjoram, a perennial, blooms mid-summer. Honey from Marjoram is high in flavor, aroma, and quality. ~Sweet Clover, an annual, produces a white honey that is mild and spicy. ~Motherwort, a perennial, blooms most of the summer. Very easy to naturalize in waste areas, its honey is amber with a strong mint overlay. ~Mountain-Mint is an abundant source of nectar. 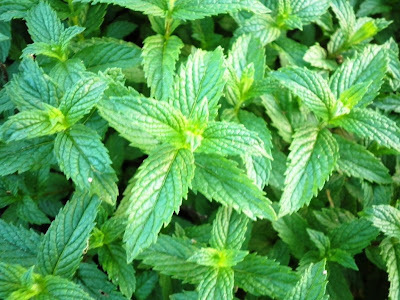 A perennial, it produces minty flavored honey. 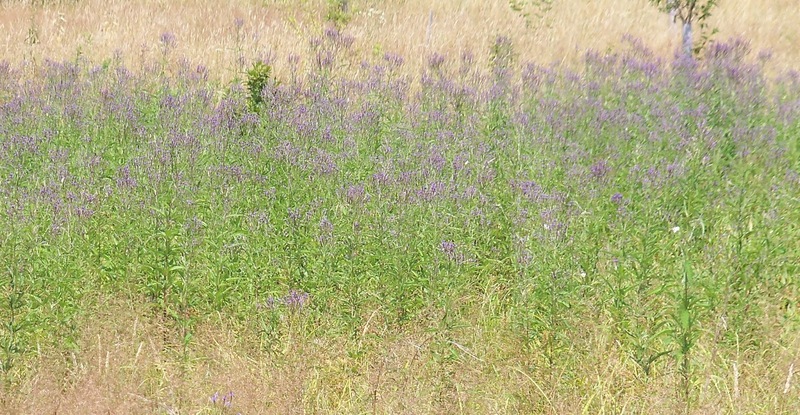 ~Blue Vervain grows in wet lowlands. 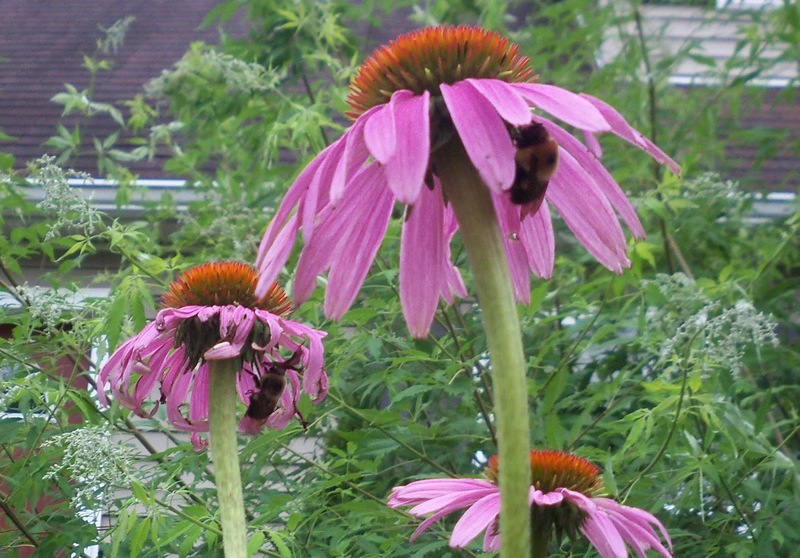 This perennial produces good nectar in July and August with honey that is dark in color and pleasantly flavored. American Foul Brood [AFB] is another bee colony disease that beekeepers are striving to eradicate. Studies have been ongoing that two fatty acids (palmitic and oleic) found in some pollens are able to kill AFB. Two fatty acids (linoleic and linolenic) have been found to be effective against AFB in laboratory tests. It has been asserted that antibiotic pollen in one bee cell, soaking through one wall of a neighboring cell has the potential to essentially kill bacteria in seven cells, as all cells are six-sided. Experiments with fields of Borage, which contains four of the fatty acids mentioned above, are ongoing. And remember: Comfrey, Calendula, and Plantain –rubbed on bee stings- soothes pain/itch and decreases swelling. Homeopathic Apis works great, too! All of our mints are up and waving. It won't be long before they start to bloom and the pollinators will be buzzing around them. The mint family (lamiaceae) is very large. Although right now I'm thinking about the mentha or menthol group, this family includes lavender, basil, thyme, and catnip for starters, and even many common weeds like dead nettle and ground ivy. A family reunion for lamiaceae would be quite diverse. 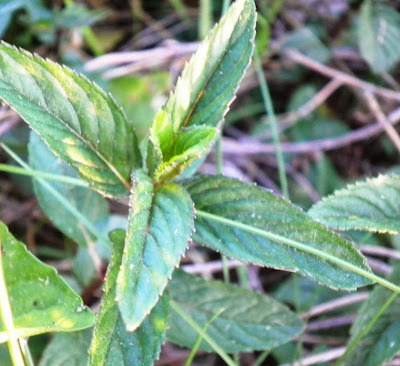 In this part of the country, meadow mint is something that most country kids brought home for tea. It was also encouraged in farmhouse gardens. Spearmint is what I think of as "meadow mint" and it grows wild in many places. The creek where I spent most of my childhood summer days was lined with it - along with stinging nettle (we called it burn hazel), wild forget-me-nots, and jewelweed. For years, I associated the scent of spearmint vaguely with tadpoles, newts, sweat, and sunfish. It showed up here on the farm, and has become a renewed favorite for my brother-in-law, who has nurtured a patch (in addition to that which has been plowed in the fields, and will forever continue to spread). 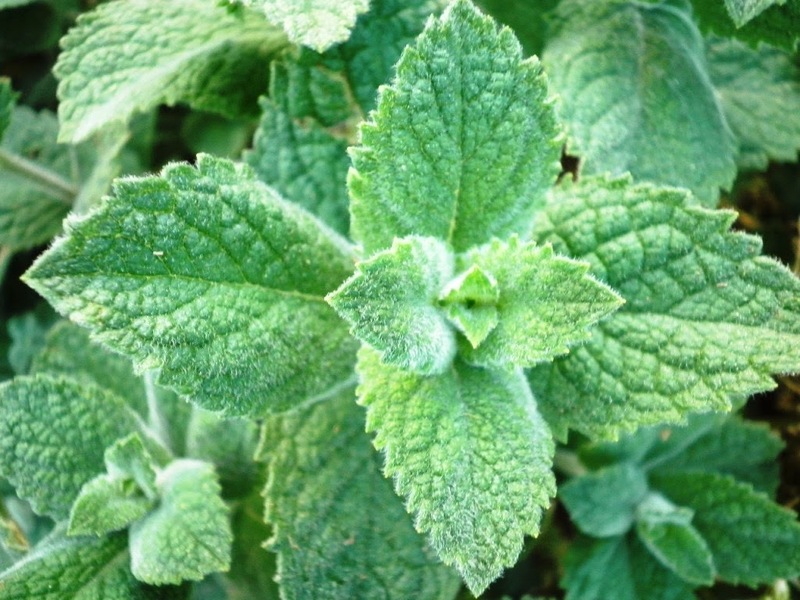 Around the same time, another mint that Susan Hess identifies as "fuzzy mint" while many also call it apple mint, but it is a very sweet and mild spearmint to my tastes, showed up and has also spread. I planted peppermint which also got plowed one year, so now it is a loooong row, and then later, chocolate mint went into the garden. Chocolate peppermint tastes very strong to me, like peppermint patties, but the chocolate part isn't that pronounced (again, to me). Chocolate mint. Note the dark stems and veins. Mints are very much taken for granted. They can be invasive, so we need to take care where we plant them, but once they're in they ask for nothing. They will thrive on being ignored. Mint is in so many things! Toothpaste and mouthwash are usually mint flavored (a very miniscule amount of the essential oil is used). Candy and gums are made with mint, and we even use menthol derived from the plant in salves or commercial preparations to cool sore muscles or arthritic joints. The leaves are combined in many teas, and fruit and/or grain dishes benefit from the chopped leaves. One of our best selling soaps contains mint. And what would the Kentucky Derby be without mint juleps? For such an unassuming plant that we don't think that much about, we sure use it a lot. Do I need to mention mint chocolate chip iced cream? 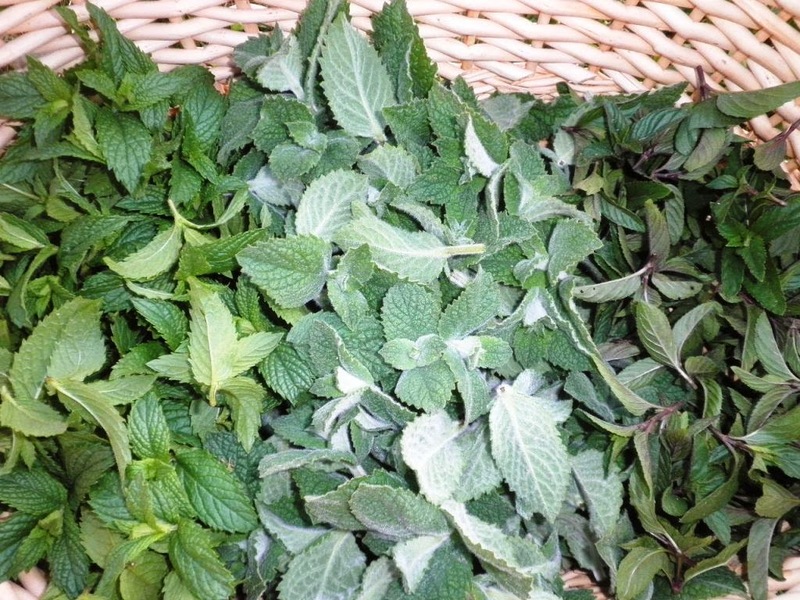 Meadow mint, fuzzy mint, and chocolate mint together in a basket. Above, I've gathered the three mints that I use in one of the tea blends I make. It's early, so the gathering is comparatively small and this will only dry down to a couple of ounces (if that), so every day, I'll toss the contents of the basket until it is dry. Recently, there have been articles about herb teas containing very little of what is on the label, but THIS is how small herbal businesses make their blends. No grass, no filler, just the beautiful fresh herbs in there. Medicinally, mint has a lot to offer too. It is so cooling and relaxing that it just claims a hot summer night. Iced mint tea on the porch, nice and sweet - right? It's full of antioxidants, has antibacterial properties, and has long been used for settling an upset tummy or flatulence. If you're prone to GERD, avoid peppermint, though. My friend Betty Pillsbury clued me into the fact that peppermint will relax the esophageal valve that causes that particular problem - but spearmint is fine. The tea calms coughs, soothes colds and sore throats, and can help bring down a fever. While the essential oil is used commercially in all of these culinary treats, a very small quantity is toxic or even fatal (less than 1/4 ounce). A single drop can more than sufficiently flavor over a pound of mint candy. Use of the essential oil on infants can cause cardio-respiratory failure. Grow and use the plants - it's got all the strength you need. At this time of year, most days end with my sister and me making 6 batches of soap, and then the next morning we cut and stack it. We're going to have a bumper crop of bayberries this year! I threw some iris roots under the elder. They like it. Lupine was in the wildflower seed mix last year, and will soon bloom. Centaury - one of Mom's favorites, still comes back year after year. Lambsquarters are as common as plantain and chickweed here. Not sure, but I think this is a locust tree in bloom. Have to get a closer look. Walking to work is a pretty sweet deal.